On November 11, Mimaki kicked off a 25-city East and West Coast road show aimed at demonstrating the capabilities of its wide-format printing portfolio, and how those devices can be used to help grow business, offer new types of printed products, and find new revenue opportunities. On Friday, November 14, the road show pulled into Saratoga Springs, N.Y.’s Grant Graphics. Grant Graphics is a dealer for both Mimaki and Roland wide-format printers, as well as a variety of finishing equipment, and offers a variety of business development and consulting services. Company principal Skip Grant has long been a tireless evangelist for wide-format and specialty graphics printing. The day-long event was a mix of hands-on product demonstrations and educational presentations that highlighted the latest Mimaki models and features, as well as some of today’s top high-value applications. The event drew interested printing company representatives from across New York State. Mimaki’s Jim Maffeo was demonstrating the CJV300 cut-and-print machine. Using solvent inks and available in 54- and 64-inch widths, the CJV300 is suitable for a wide variety of materials, such as labels, decals, indoor and outdoor signage, even T-shirt transfers. In addition to the standard CMYK colors, the CJV300 inkset also includes white (for doing layered graphics, printing on clear substrates, or on dark-colored materials), light black (for fine-art photography, especially black-and-white photography), and silver (to add a variety of metallic effects). Although UV (see below) and latex have drawn much of the attention from an ink standpoint, “solvent isn’t going anywhere,” said Maffeo. 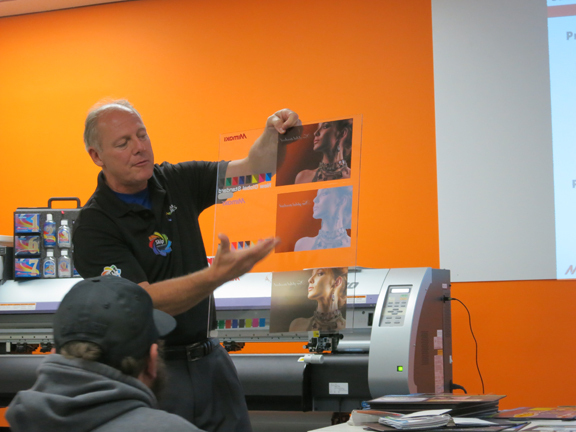 Mimaki’s Jim Maffeo and the solvent-based cut-and-print CJV300. The CJV300 offers the unique ability to cut first and then print. Still, it was the UV printers that drew the bulk of the attention. Attendees clustered around as Grant Graphics’ Michael Gentile demonstrated the JFX200 LED-cured UV printer, a 98.4-inch-wide relatively entry level (under $80,000) flatbed printer. It can print on a variety of rigid materials—up to two inches thick, and depending on the inkset purchased, is also suitable for packaging applications and vehicle graphics. UV inkjet is not just for printing big stuff, but is also short-run customized advertising specialty items—tchotchkes, as we like to say—such as pens, hockey pucks, golf balls, thumb drives, bottle openers, coasters, you name it. Mimaki’s tabletop UJF printer is designed for these types of applications, and with the help of jigs and blanks—custom frames that hold the items in place during printing—the machine can print accurately and quickly on even oddly shaped items. Certain models in the series can also be fitted with what Mimaki calls a Kebab option, a rotating frame that lets users print on cylindrical objects such as bottles and even candles, applications that were once strictly the purview of pad printing. There are very few things that UV printers can’t print on these days. In addition to the hands-on product demos, Grant and Mimaki’s Kohei Kobayashi tag-teamed a presentation that provided the features and technical specs of the Mimaki product line, illustrated by physical output that showed those features translated into real-world practical terms. In particular, different inksets can yield different results, either in terms of image characteristics or speed. A dual CMYK system can boost speed, but adding, say, orange ink can help improve not only Pantone color matching, but also fleshtones. The presenters also passed around a metallic ink swatchbook that showed the variety of metallic effects that are possible. Some of the hot applications for metallics are custom labels, wine bottle labels, POP displays, and vehicle wraps—not just cars, said Grant, but also “snowmobiles.” This is upstate New York, after all. Skip Grant shows layered printing with white ink on clear substrates. “There’s a choice of ink depending on what people want,” said Grant. Other features discussed included MAPS3 (MAPS is an acronym for Mimaki Advanced Pass System), an algorithm in the RIP that reduces banding; the bulk ink system that can run for up to 16 hours of uninterrupted printing (depending on coverage, natch); and the fact that it is a closed ink system that keeps out air and dust, which can contaminate the ink. 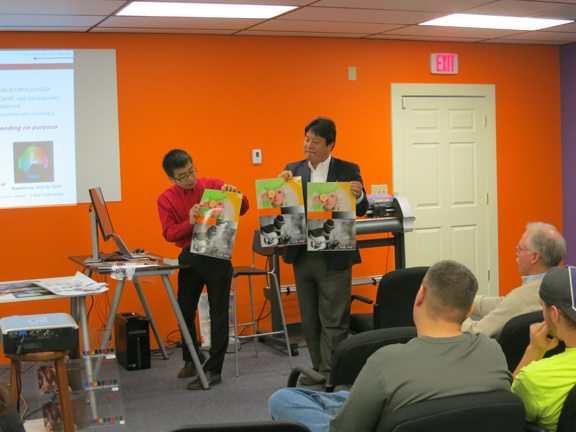 Mimaki’s Kohei Kobayashi (left) and Naoya Kawagoshi demonstrate wider print gamut and enhanced fleshtones using orange ink. Grant Graphics not only sells the equipment, but also offers print-for-pay services for local businesses and other organizations, such as the National Museum of Dance in Saratoga. 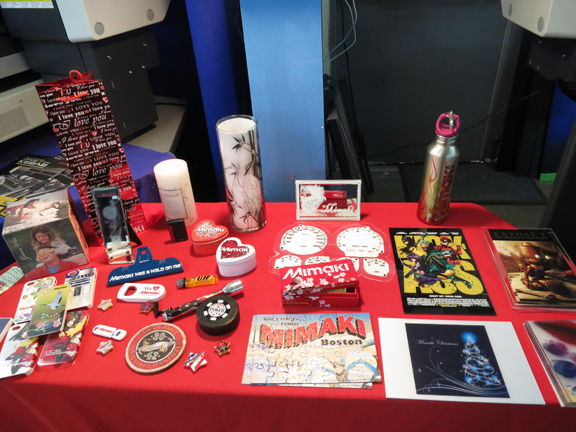 The Mimaki Mini Expo continues through December 19, with concurrent East and West Coast legs. For dates, cities, and venues, visit the Mimaki USA Mini-Expo site.